Get Free SEO Software with every Package! When you take advantage of our SEO packages you will have access to a comprehensive custom made tracking laboratory from which you can track all the data from your website. Getting the attention and traffic that your site deserves isn’t always as simple as clicking your heels together, and bringing in the numbers can take considerable time and effort. Fortunately a new SEO Software designed by the development team at Cozy Digital has now been launched, which provides unparalleled insight into your site. Cozy Labs offers more than an overview of your site, it goes much deeper. Think of Labs like a highly skilled employee who never takes a break and always gets you the results. Getting and maintaining top rankings in a competitive market is not a one-time battle to the top but a constant Cozy Digital. If you don’t evolve you get left behind and the Labs service offers you a completely transparent view into your sites SEO data. From monitoring rankings to tracking competitors, Labs is an SEO tool which will give you the edge in your industry. With the Labs SEO software you stand to drastically reduce the time and money spent on research and statistics giving you greater scope to concentrate on running your business. The service handles all research for you efficiently and effectively, giving you unparalleled peace of mind through a vast selection of features. Building up your ranking keyphrases is what gets you up into the first page for searches, which means more sales for you. Through Cozy Labs you can instantly view the rankings of all your selected keyphrases over the top search engines including Google, Yahoo and Bing. Not only this, but you can also view the progress of each keyphrases movement over time ensuring that things are moving in the right direction. PageRank is an excellent indicator to determining your web pages position within Google’s search results. It works like a vote for your site. The more votes you get the higher your page will rank. The higher ranking your page achieves the more likely you are to appear in the top results. By monitoring this for each page of your site you can determine how highly Google regards each page and build from there. One of the hardest parts of SEO is to monitor your sites referrers. Those sites linking back to, or in a sense voting for yours. These links can play a major part in boosting not only your sites profile but also its PageRank. Labs gives unrivalled insight into your referrers offering their PageRank and the PageRank boost you’re receiving as a result. This offers the total list of all links or votes to your site. To compete in the market it is vital that you generate backlinks and with Cozy Labs you can always be aware of how this is progressing. Social Media has grown exponentially in the last few years and the potential is there for web businesses to benefit from this vast society of users. With Twitter’s users in the millions it would be a mistake not to take the initiative, and Labs can help. By providing a regularly updating list of Tweets which mention your site, Labs gives you the ability to monitor your brand awareness in this vast potential marketplace. In addition Labs monitors the number of bookmarks your site has received from a selection of important social bookmarking sites including Digg and Delicious. When a search engine visits your pages they analyse your keyphrase density to determine how relevant your pages are to a particular keyphrase. 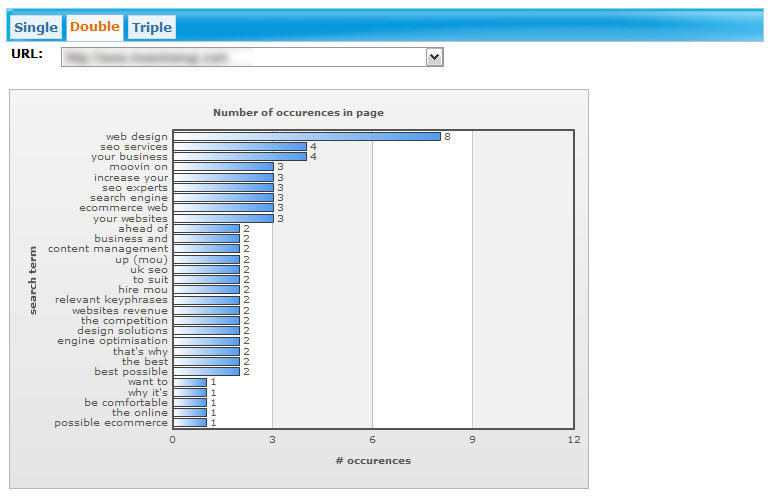 Keyphrase Density is all about the content of your page and how often keyphrases turn up in the text. By evaluating your keyphrase density you can determine how to better optimise your sites content to become more relevant to the search engines. Does my Indexing Look big in this? 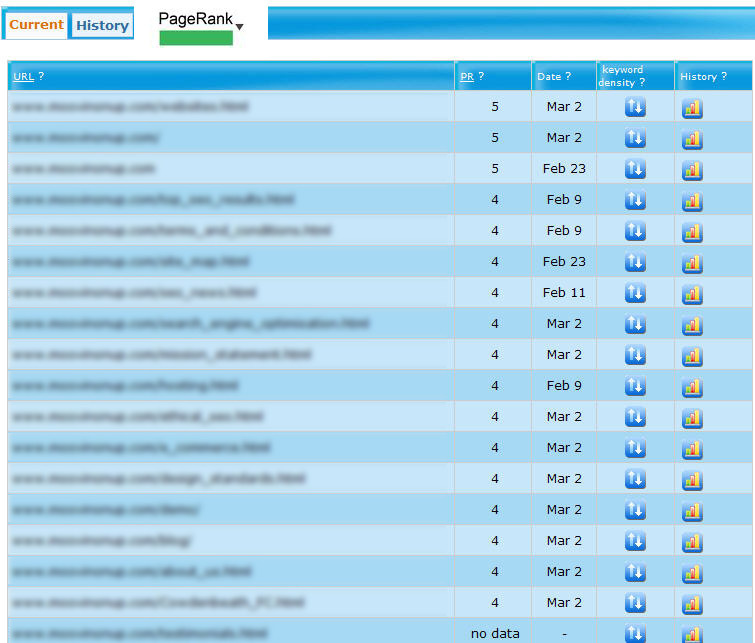 For the success of your page you want to get as many pages indexed as possible by the search engines. Labs monitors your indexed pages in real time for Google, Yahoo and Bing letting you know exactly how many pages are indexed then and there. Forget supplemental, Go Full Index? When indexing your pages Google stores them in two main categories, index and supplemental index. Supplemental pages are practically ignored by Google, but by utilising the Supplemental Index Ratio you can find out how many of your pages fall into this category. Whereas before you would have been unaware of this, you can now optimise pages for better SEO results. As stated, backlinks are a vital asset to your site and occasionally you will find a site removes their backlink to you. This is a loss that could previously have gone unrecorded but no longer. With Labs backlink watchdog feature you are constantly aware of the status of all your backlinks and if one changes you’ll be well aware of it and can contact the site to rectify the problem. To know about your competitors is to give yourself a very useful upper hand in the industry. Labs offers a variety of insights into some of the most useful aspects of your competitions keyphrase strength. With insight into the opposition’s strength for your keyphrases, you can determine their weaknesses and take the initiative. By employing Labs you acquire more than just a SEO Tool but a complex platform on which to build your online business strategy. Through utilising the software you gain a comprehensive insight into your sites potential with instant access to a vast array of you sites data. By removing the need for constant research you can enjoy more time improving your site and boosting your potential for success. Don’t Forget: This software comes free when you choose any of our SEO packages today!